The government has been urged to make the reporting of child abuse mandatory after cover-ups at two leading Catholic schools. 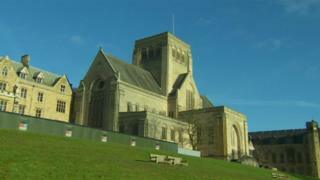 A recent report found monks at Ampleforth in North Yorkshire and Downside in Somerset hid allegations of "appalling sexual abuse". The abuse dated back the 1960s and involved pupils as young as seven. The House of Lords heard that one school took legal advice over whether it had to report the abuse. Raising the scandal in the Lords, Liberal Democrat peer Baroness Walmsley said there was a need to introduce a law to make the "reporting of child abuse an regulated activity". She said there was evidence "that one of the schools consulted its legal adviser as to whether it was legally obliged to report the abuse that it knew about". "Having learned that it was not so obliged, it decided to cover it up," she added. In response, Education Minister Lord Agnew of Oulton said it was "absolutely unacceptable for anyone to conceal abuse". "I know that there are calls for mandatory reporting," he said. But highlighting a consultation carried out, he added: "We had 760 responses from social workers, police officers and other connected parties. "Some 70% of them felt that mandatory reporting would have an adverse impact; 85% said that it would not, in itself, lead to the appropriate action being taken." He added that the government was "committed to ensuring that legislation can adequately deal with this". The Independent Inquiry into Child Sexual Abuse made the claims in a report on the English Benedictine Congregation, which has 10 monasteries in England and Wales. The report said the allegations were hidden to protect the schools' reputations.